We’d love your help. 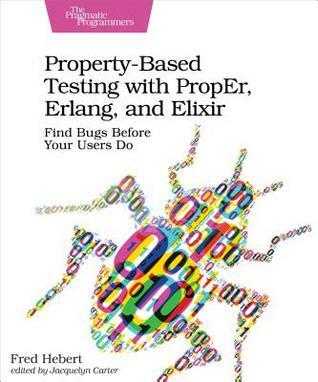 Let us know what’s wrong with this preview of Property-Based Testing with Proper, Erlang, and Elixir by Fred Hebert. Property-based testing helps you create better, more solid tests with little code. By using the PropEr framework in both Erlang and Elixir, this book teaches you how to automatically generate test cases, test stateful programs, and change how you design your software for more principled and reliable approaches. You will be able to better explore the problem space, validate Property-based testing helps you create better, more solid tests with little code. By using the PropEr framework in both Erlang and Elixir, this book teaches you how to automatically generate test cases, test stateful programs, and change how you design your software for more principled and reliable approaches. You will be able to better explore the problem space, validate the assumptions you make when coming up with program behavior, and expose unexpected weaknesses in your design. PropEr will even show you how to reproduce the bugs it found. With this book, you will be writing efficient property-based tests in no time. Most tests only demonstrate that the code behaves how the developer expected it to behave, and therefore carry the same blind spots as their authors when special conditions or edge cases show up. Learn how to see things differently with property tests written in PropEr. Start with the basics of property tests, such as writing stateless properties, and using the default generators to generate test cases automatically. More importantly, learn how to think in properties. Improve your properties, write custom data generators, and discover what your code can or cannot do. Learn when to use property tests and when to stick with example tests with real-world sample projects. Explore various testing approaches to find the one that's best for your code. Shrink failing test cases to their simpler expression to highlight exactly what breaks in your code, and generate highly relevant data through targeted properties. Uncover the trickiest bugs you can think of with nearly no code at all with two special types of properties based on state transitions and finite state machines. Write Erlang and Elixir properties that generate the most effective tests you'll see, whether they are unit tests or complex integration and system tests. To ask other readers questions about Property-Based Testing with Proper, Erlang, and Elixir, please sign up. Fred Hebert is a systems architect at a video surveillance, access control management, and license plate recognition company. He previously worked as a tech lead on a cloud platform’s networking services. He has also worked in real-time bidding systems, as a professional Erlang trainer and course maintainer, and is one of the maintainers of the principal Erlang build tool. He wrote 3 books about Er Fred Hebert is a systems architect at a video surveillance, access control management, and license plate recognition company. He previously worked as a tech lead on a cloud platform’s networking services. He has also worked in real-time bidding systems, as a professional Erlang trainer and course maintainer, and is one of the maintainers of the principal Erlang build tool.